We just can’t get along without Okinawa. During the 1960s and ‘70s, Okinawa served as a forward base for the war in Vietnam. Military supplies flowed through the island - everything from toilet paper and cigarettes to guns and ammunition. But now - 40 years later - a new revelation has come to light. Agent Orange, the same dioxin-laden defoliant that has caused massive suffering to the people of Vietnam, was also used on Okinawa. For the first time, QAB’s Defoliated Island reveals the presence of these poisons on Okinawa. Accompanying freelance journalist, Jon Mitchell, to the United States, the documentary features interviews with some of those American veterans sickened by Agent Orange while serving on the island. To kill the weeds and keep things looking neat, I sprayed Agent Orange around the buildings and the fences of the base. Agent Orange was transported to the island roughly once every two months. Many of these former service members are suffering from diabetes, leukemia and severe skin disorders. In some cases, their children have also been sickened. The problem has affected the future generations, too. My grandchildren have also been poisoned. According to these veterans, Agent Orange was stored and sprayed on more than 15 bases on Okinawa. But the American government denies their accounts and claims it has no records related to the presence of Agent Orange on Okinawa. 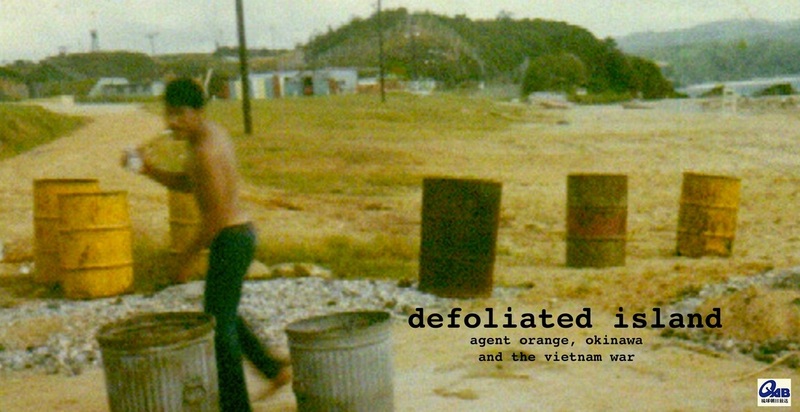 This program - broadcast on May 15 2012 - the 40th anniversary of Okinawa’s reversion to Japan - unmasks the usage of Agent Orange on Okinawa - and explores the ongoing relationship between the island and the legacy of war.